The 2018 New York Giants were a top heavy team, with some elite talent at a number of positions but with the overall quality of the rest of the roster rapidly falling off. And the wide receiver position was just one example of this issue. Coming out of training camp, the team’s top wideouts were Odell Beckham, Sterling Shepard, Cody Latimer, Kaelin Clay, and Russell Shepard. Injuries hit this position hard, including Beckham (4 games), Latimer (placed on IR and later returning, missing 10 games), and Clay (only playing in two games before being placed on IR and later waived). Thus began a revolving door at the position for much of the season at the 3rd, 4th, and 5th receiver spots. Those who later saw playing time at wide receiver and/or special teams included Bennie Fowler, Corey Coleman, Jawill Davis, Quadree Henderson (also ended up on IR), and Stacy Coley (waived after one game). There was no better indicator of the sharp divide between Beckham (77 catches) and Sterling Shepard (66 catches) and the rest of the wide-receiving corps than the reception totals. No other wide receiver on the roster had more than 16 catches. And combined, the other receivers had a total of just 46 receptions. 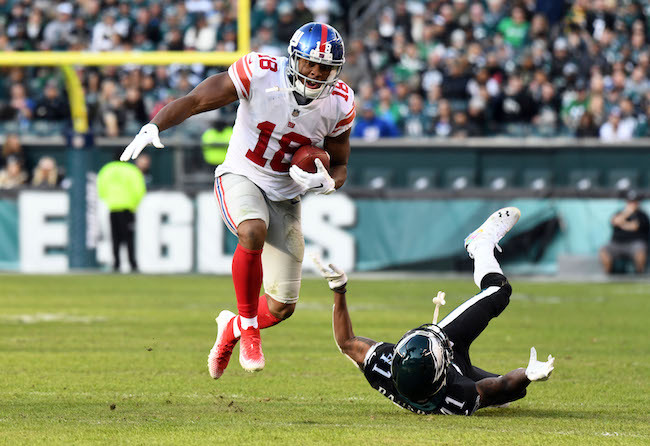 Part of this was a function of Eli Manning having other options, including running back Saquon Barkley (91 catches) and tight ends Evan Engram (45 catches) and Rhett Ellison (25 catches). But it was obvious that opposing defenses did not concern themselves too much with the other wideouts. Of course, the primary headliner was Beckham, who was coming off a very serious fractured ankle that required surgery and which caused him to miss 12 games in 2017. While some contend that Beckham did not appear to be quite the same player, statistically-speaking, his numbers were on par with his 2016 season if adjusted for the four games he missed in 2018 due to a somewhat mysterious quad injury. What was missing were the eye-opening, huge, explosive plays. The good news is that despite the media’s goal of turning him into a click-bait lightning rod, Beckham did seem to mature and did not sulk as more team and fan attention shifted to Barkley. Sterling Shepard is a very solid, complimentary piece as a slot receiver, but it has become pretty clear that he is not a consistent vertical threat. He has averaged 63 catches, 762 yards, and 4.7 touchdowns per year in his first three NFL seasons. Overall, it is fair to say that more was expected from Beckham, Shepard, and Latimer than a total of 154 catches and just 11 touchdown receptions. 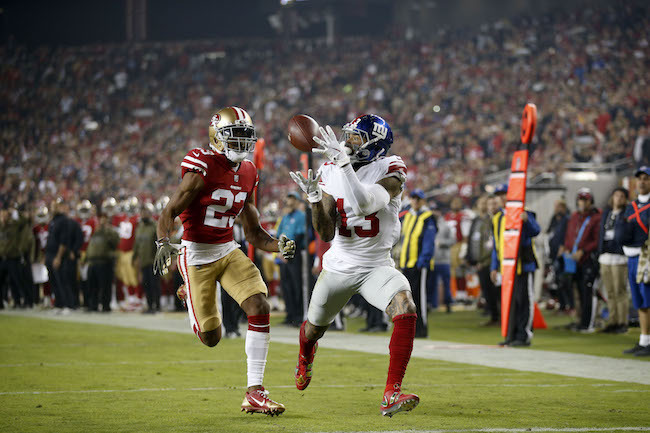 Despite missing the last four games of the season with a quad injury, Odell Beckham, Jr. accrued 77 receptions for 1,052 yards (13.7 yards per catch) and six touchdowns. It was Beckham’s fourth 1,000-yard season in his first five years in the NFL (Beckham missed 12 games in 2017 with a fractured ankle that required surgery). Beckham’s accolades already include Pro Football Writers of America “Rookie of the Year” (2014), second-team All-Pro (2015, 2016), and Pro Bowl (2014, 2015, 2016). All of this despite constant double teams by opposing defenses. Beckham was drafted in the 1st round of the 2014 NFL Draft by the Giants. While Beckham lacks classic size, his long arms, big hands, and tremendous jumping ability give him a very good catch radius. Beckham is an explosive athlete with excellent speed, quickness, and agility. Beckham runs good routes, is very quick out of his breaks, adjusts exceptionally well to the football, and regularly makes the circus catch. He is very dangerous with the football in his hands after the catch. Competitive, passionate, and hard working. 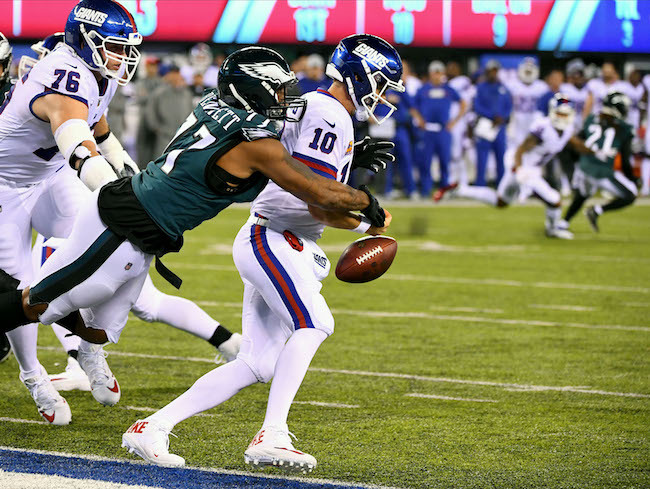 The Giants placed Quadree Henderson on Injured Reserve in late November 2018 with a fractured shoulder. The 5’8”, 192-pound Henderson was originally signed as an undrafted rookie free agent by the Pittsburgh Steelers after the 2018 NFL Draft. The Steelers waived him before the season started. The Giants signed Henderson to the Practice Squad and then the 53-man roster in October 2018, and then back to the Practice Squad and the 53-man roster again in November. Henderson played in five games for the Giants and returned five kickoffs (22.4 yards per return average) and nine punts (7.6 yards per return average). The New York Giants have placed wide receiver Cody Latimer (hamstring) and linebacker Ray-Ray Armstrong (concussion) on Injured Reserve. The team also waived cornerback Donte Deayon. The Giants signed Latimer as an unrestricted free agent from the Denver Broncos in March 2018. He played in four games with one start, with six catches for 108 yards. The 6’2”, 215-pound Latimer was originally drafted in the 2nd round of the 2014 NFL Draft by the Broncos. Armstrong was originally signed as an undrafted rookie free agent by the St. Louis Rams after the 2013 NFL Draft. He has spent time with the Rams (2013-2014), Oakland Raiders (2014-2015), and 49ers (2015-2017). The Giants claimed Armstrong off of waivers from the San Francisco 49ers in late November 2017. Armstrong played in five games for the Giants in 2017 with one start. This year, he has played in six games with one start, accruing 20 tackles. The Giants originally signed Deayon as an undrafted rookie free agent after the 2016 NFL Draft. He spent his rookie season on the team’s Practice Squad and Injured Reserve. Deayon began the 2017 season on the Giants’ Practice Squad and was signed to the 53-man roster in October. He was placed on Injured Reserve in late November 2017 with a fractured forearm. Deayon played in four games this year before he was cut. To fill those roster vacancies, the team signed free agent wide receiver Bennie Fowler and signed linebacker Ukeme Eligwe and cornerback Grant Haley from the team’s Practice Squad. The 27-year old, 6’1”, 212-pound Fowler originally signed as an undrafted rookie free agent with the Denver Broncos after the 2014 NFL Draft. He has spent time with the Broncos (2014-2017), Chicago Bears (2018), and New England Patriots (2018). Fowler has played in 45 regular-season games with five starts. He has 56 career catches for 698 yards and five touchdowns. Eligwe was signed to the Practice Squad in September 2018 after he was waived by the Kansas City Chiefs. The 6’2”, 239-pound Eligwe was originally drafted in the 5th round of the 2017 NFL Draft by the Chiefs. As a rookie, Eligwe played in 14 regular-season games with one start. He finished the year with five tackles and one sack. Haley was originally signed by the team as an undrafted rookie free agent after the 2018 NFL Draft. The New York Giants have signed wide receiver Kalif Raymond, defensive end Myles Humphrey, and cornerback Ronald Zamort to the Practice Squad. The 5’9”, 160-pound Raymond was originally signed by the Denver Broncos after the 2016 NFL Draft. Raymond has played in 12 NFL regular-season games, four with the Broncos, two with the Jets, and six with the Giants. The Giants signed Raymond to the Practice Squad in October 2017 and the 53-man roster in November 2017. They cut him in September 2018 before the season started. The 23-year old, 6’3”, 238-pound Humphrey originally signed with the Baltimore Ravens after the 2018 NFL Draft. He spent most of September on the Ravens’ Practice Squad. The 26-year old, 5’10”, 174-pound Zamort originally signed with the Arizona Cardinals as an undrafted rookie free agent after the 2016 NFL Draft. Not practicing on Tuesday due to injury were wide receiver Russell Shepard (neck), left tackle Nate Solder (unknown), linebacker Olivier Vernon (ankle), and linebacker Connor Barwin (knee). Tight ends Evan Engram (knee) and Rhett Ellison (foot) both practiced. Defensive end R.J. McIntosh, who is currently on the Reserve/Non-Football Injury List is now eligible to begin practicing with the team. McIntosh was drafted by the Giants in the 5th round of the 2018 NFL Draft. An undisclosed ailment prevented him from practicing all spring and summer. The Giants have a 21-day window to activate him to the 53-man roster. If they do no activate him, McIntosh will remain on the Reserve List. The Giants are off on Wednesday and return to practice on Thursday in preparation for Monday night’s road game against the Atlanta Falcons.